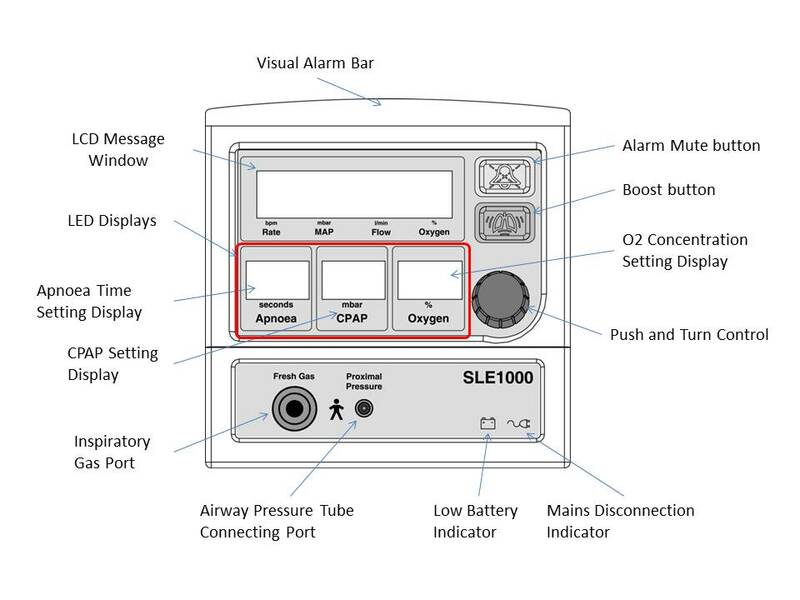 A CPAP/DPAP driver “SLE1000” is a nasal DPAP generator similar to Infant Flow SiPAP. 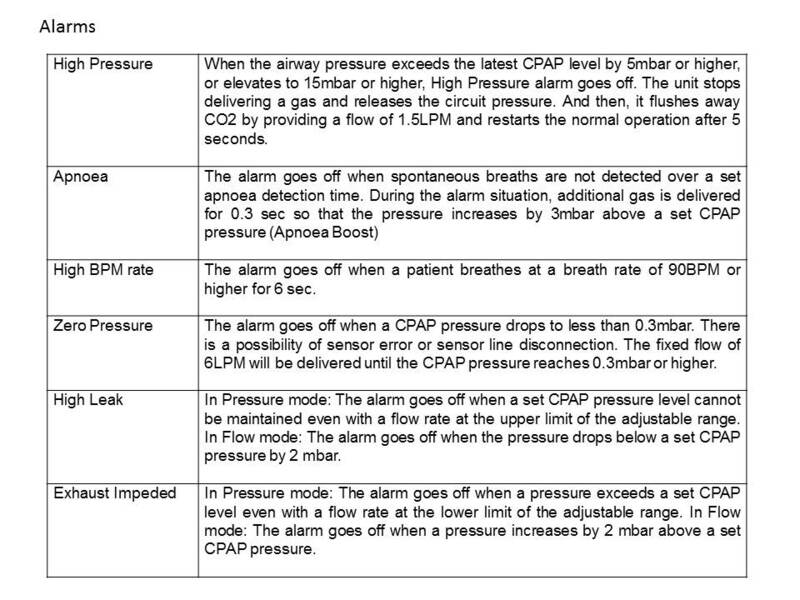 In conventional nasal DPAP drivers, a CPAP pressure is indirectly determined by setting a flow rate. 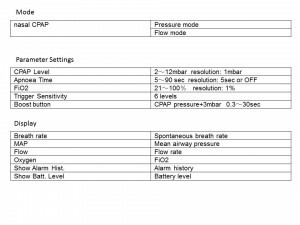 In this model, however, a CPAP pressure is directly selected and the set pressure is maintained by automatic flow adjustment (Pressure mode). 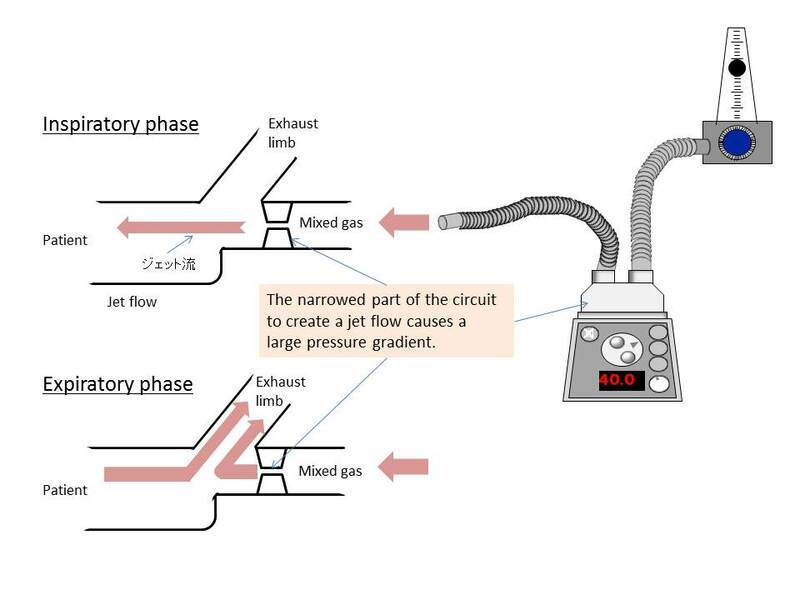 SLE1000 adopts SLE2000’s mechanism using a reverse jet flow generated from the expiratory block to deliver nasal CPAP, which appears to be a typical SLE style of pressure control. 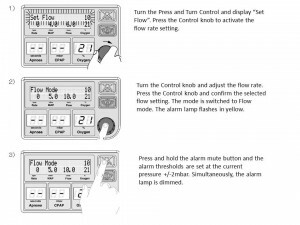 Recently, the software has been updated and a new mode which offers a user adjustable flow setting like Infant Flow SiPAP has been added (Flow mode). Please note that this article mainly focuses on the new version (Ver. 2.6.4) of SLE1000. 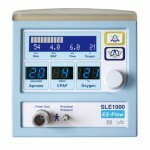 SLE1000 can be started by pressing and holding the metal mains button located at the back of the device. Following the self-check and pneumatic tests, oxygen calibration is automatically conducted. The gas is calibrated to first 21% and then 100% oxygen. After O2 monitoring is stabilized, “21” is displayed at the lower right area of the message window. This means that the unit is in a stand-by mode and parameters are ready to be set. During the pneumatic test, it is necessary to connect an air supply hose to the unit. It takes 180 seconds to complete O2 calibration using 21% oxygen as reference, and 90 seconds using 100% oxygen as reference. Also, it takes 20 seconds for O2 monitoring stabilisation. The self-check and calibration processes are all automatically performed and a user must take notice when the processes are actually on going as the unit may appear to stop functioning. All the settings of SLE1000 are configured using the Push and Turn Control located at the lower right corner of the device. 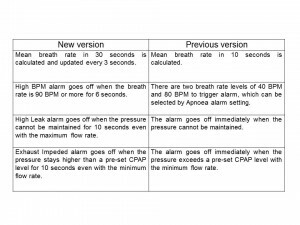 The parameters which must be set include Apnoea Detection Time, CPAP pressure, oxygen concentration and the flow rate in Flow mode. 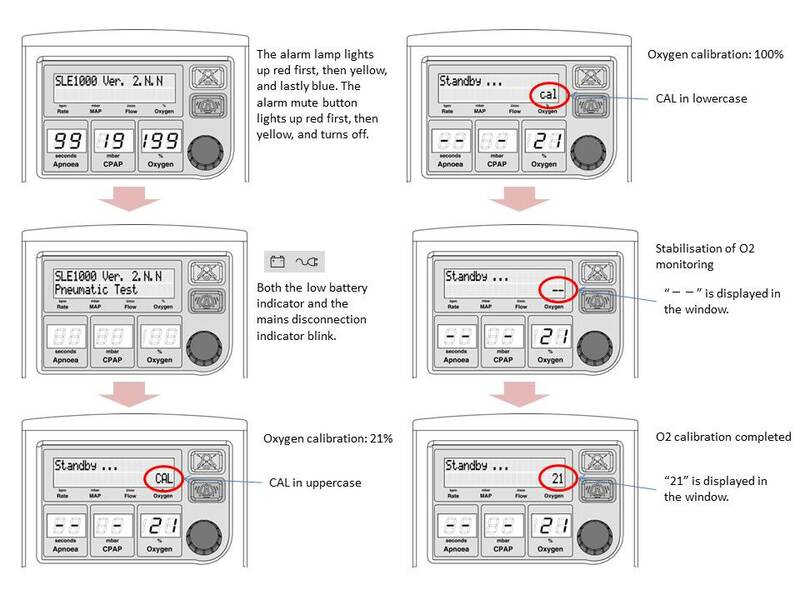 All of these except the flow rate are displayed on the LED displays. 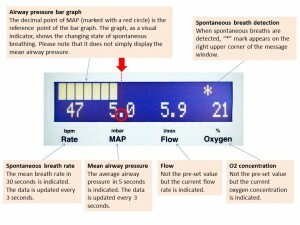 The flow rate setting should come next to the oxygen concentration. Advanced settings include alarm history, oxygen calibration, battery charge level and pressure trigger sensitivity setting. Trigger sensitivity can be set on a scale of 1 to 6 and 6 is the most sensitive. 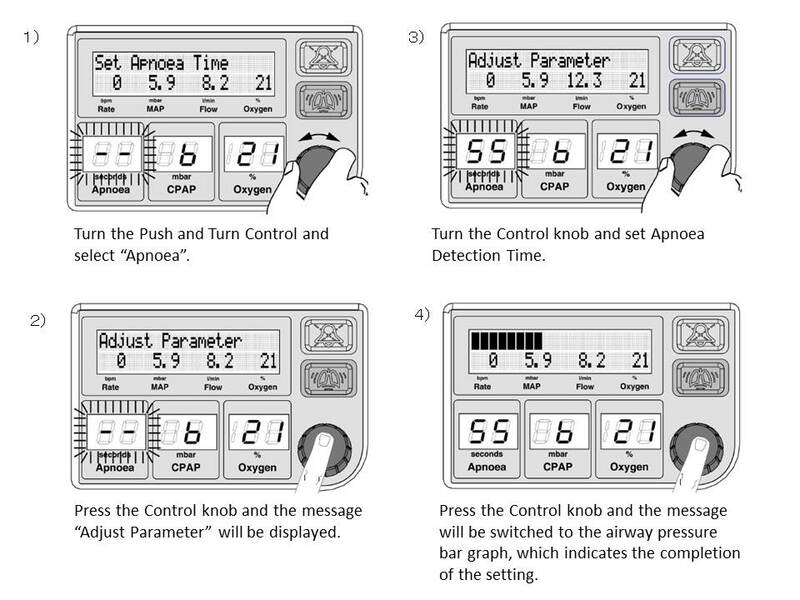 The parameter setting procedure is as follows: 1) Turn the Push and Turn Control (Control knob) and select the desired parameter; 2) Press the Control knob and confirm the selection; 3) Turn the knob and adjust the parameter value; 4) Press the knob and confirm the adjustment (Fig.3). 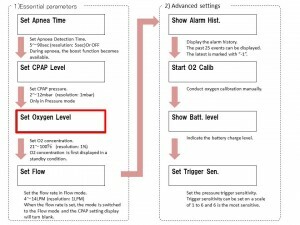 When Apnoea Detection Time is set and the alarm goes off, additional gas is delivered for 0.3 sec so that the pressure increases to 3mbar above a set CPAP pressure (Apnoea Boost). 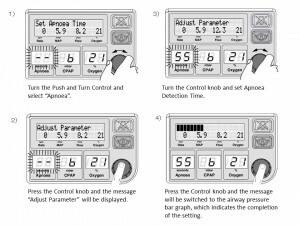 Without oxygen concentration and a CPAP pressure having been set, the advanced settings will not be displayed by rotating the Push and Turn Control. 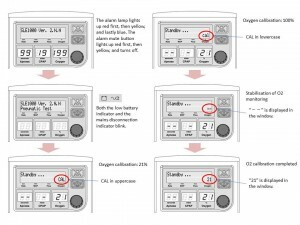 Whenever setting parameters, oxygen concentration comes first. When setting parameters, the display automatically reverts to the original state after 8 seconds without user action. While pressing and holding the Boost button, additional gas is delivered for up to 30 seconds to increase a CPAP pressure by 3mbar. On this occasion, “+3” is indicated at the right end of the message window. Additional gas is delivered at least 0.3 sec when Apnoea Boost button is pressed. 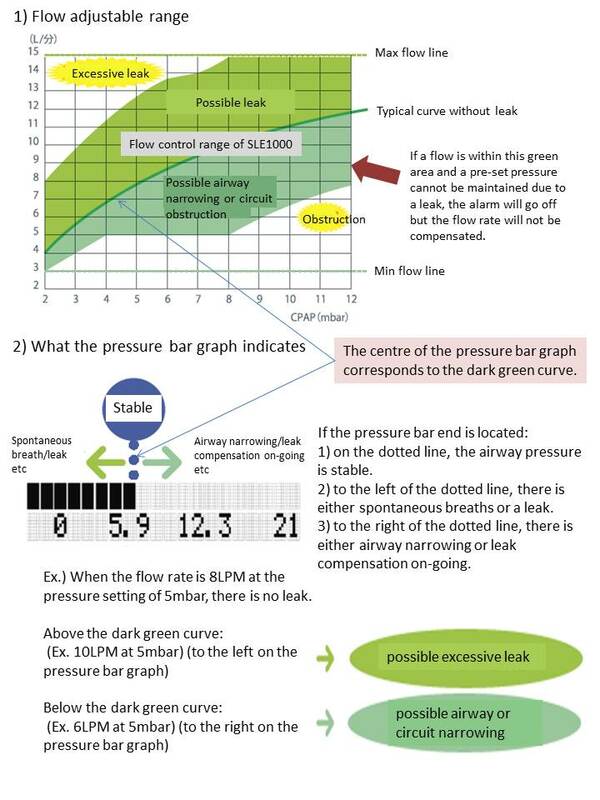 The Flow mode which allows the flow rate setting like Infant Flow SiPAP has been added to the latest version (Ver. 2.6.4). The flow rate can be configured within the range from 4 to 14LPM (resolution: 1LPM). When setting the Flow mode, the alarm lamp flashes in yellow. While flashing, press and hold the mute button and the alarm thresholds will be automatically set at the current pressure +/-2mbar. 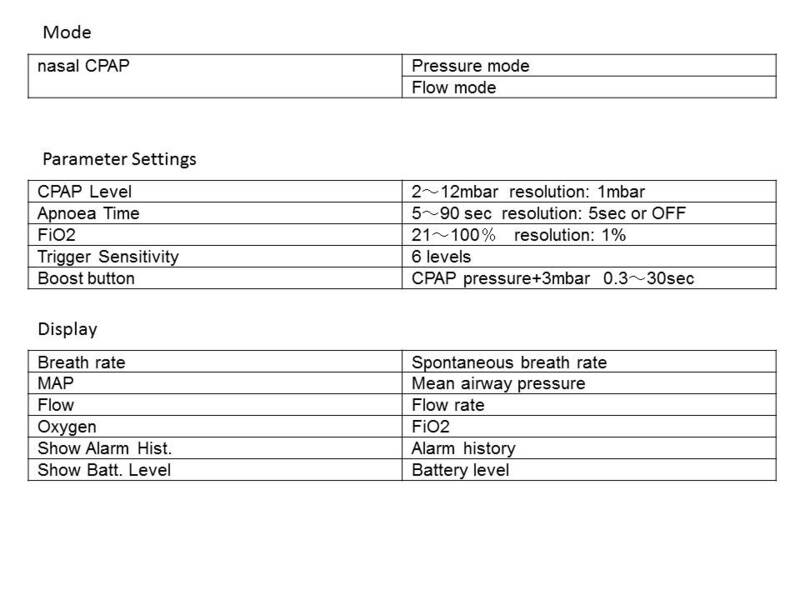 When the Pressure mode is switched to the Flow mode, the CPAP window will turn blank. In the Flow mode, when a pressure exceeds an alarm setting by 2 mbar, Exhaust Impeded alarm will go off. 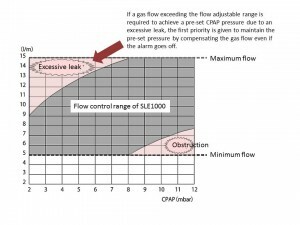 Also, if a pressure drops below an alarm setting by 2 mbar, High Leak alarm will go off. 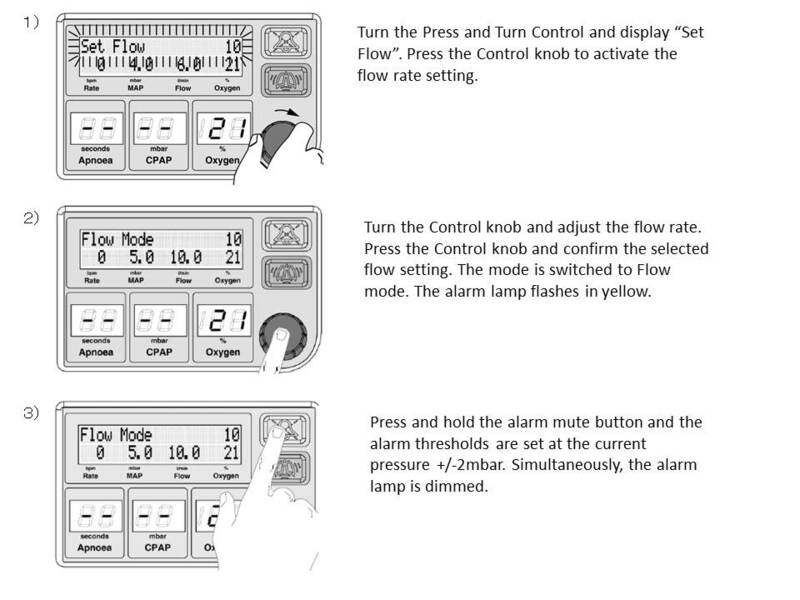 In the Flow mode, the pressure alarms can be set by pressing and holding the mute button. However, in the Pressure mode, a flow adjustment range is fixed by the algorithm and the flow alarms cannot be set arbitrarily. However, it should be noted that when pressing the Boost button, or while delivering additional gas by the Apnoea Boost function, a gas flow outside a fixed range may be delivered temporarily and no High Leak alarm will be triggered by this. 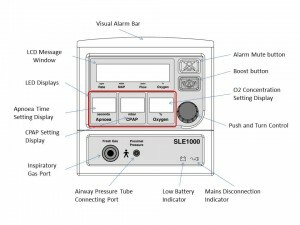 The Pressure mode of SLE1000 has a feature of the direct pressure setting when delivering nasal CPAP. 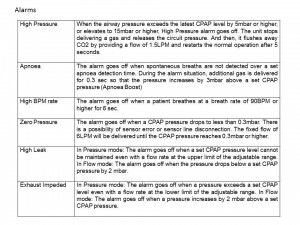 In this mode, a CPAP pressure is kept constant by a gas flow being adjusted according to leaks monitored at certain timings. 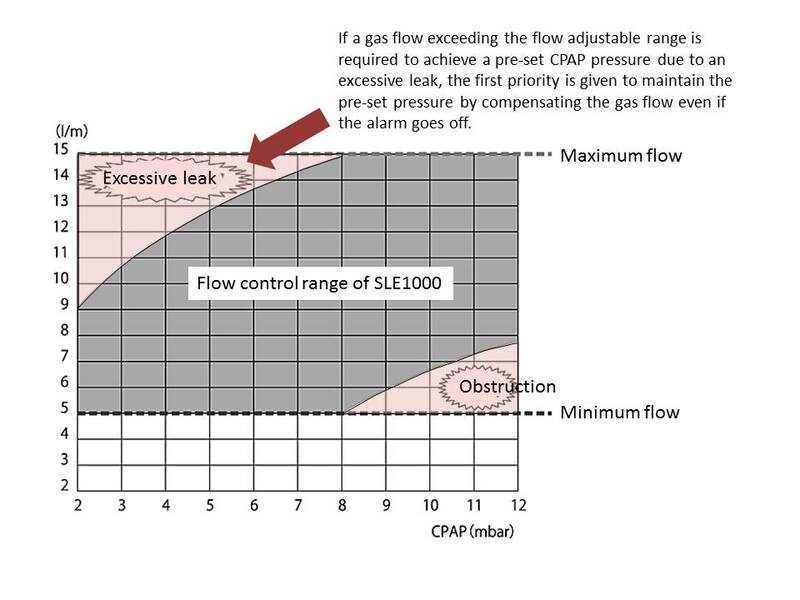 In the previous version, when a flow violated a pre-set flow control threshold, the alarm went off immediately (Fig. 5). However, in the latest version (Ver. 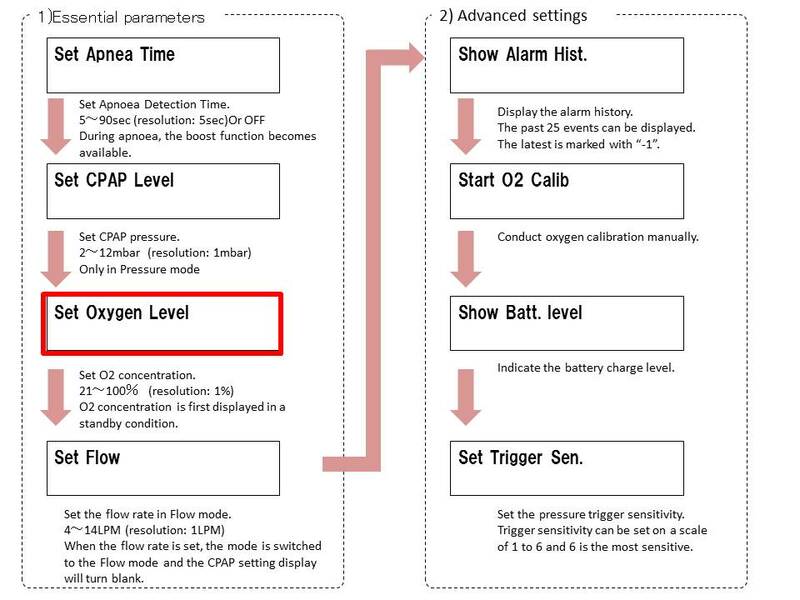 2.6.4), the alarm is triggered only when a CPAP pressure cannot be maintained by a flow delivered within the flow adjustable range (Fig.6-1) and reaching at the upper limit. A gas flow will not be adjusted if it is outside the flow adjustable range. 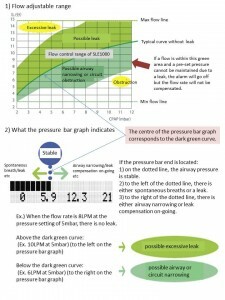 If the bar of the pressure bar graph on the message window reaches the dismal point of MAP which corresponds to the centre of the bar graph, the flow is appropriate and without leak as the dark green curve on the flow adjustable range graph shows. If the bar fails to reach the dismal point of MAP, it means that there is either a negative pressure created by spontaneous breaths or leak, whilst if the bar exceeds the reference point, there may be either airway narrowing or leak compensation on-going. In the current version (Ver. 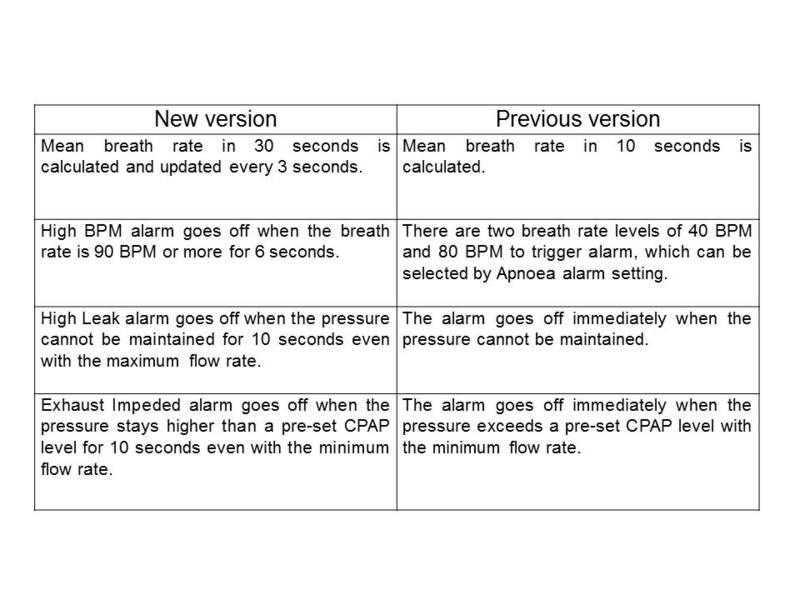 2.6.4), some of the alarm performance criteria have been modified to prevent unnecessary occurrence of alarms. A Nasal DPAP driver cannot use an automatic feeding chamber for feeding water to a heated humidifier chamber. 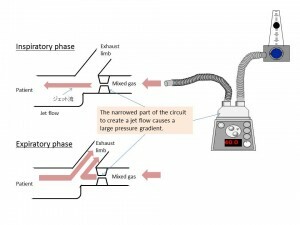 When the driver delivers an inspiratory flow to a patient, the inspiratory circuit pressure increases significantly to generate a jet stream. As the pressure reaches 100cmH2O or above, the hydraulic pressure generated by a normal automatic feeding chamber is not sufficient to feed water to the heated humidifier chamber. Therefore it is necessary to feed water manually to the heated humidifier when the device is used for Nasal DPAP. 1) SLE1000 Operation Manual, SLE ltd.
2) SLE1000 Quick Operation Manual, SLE ltd.
3) SLE1000 User Manual Version 2.6.4 software, SLE ltd.